Brandon Rhodes started using Python in the late 1990s, and for 17 years has maintained the PyEphem library for amateur astronomers. He works at Dropbox, has taught Python programming courses for corporate clients, consulted on projects like the New England Wildflower Society's “Go Botany” Django site, and will be the chair of the PyCon conference in 2016 and 2017. Brandon believes that well-written code is a form of literature, that beautifully formatted code is a work of graphic design, and that correct code is one of the most transparent forms of thought. Daniel Rocco loves Python, coffee, craft, stout, object and system design, bourbon, teaching, trees, and Latin guitar. Thrilled that he gets to write Python for a living, he is always on the lookout for opportunities to learn from others in the community, and to contribute by sharing knowledge. He is a frequent speaker at PyAtl on introductory topics, testing, design, and shiny things; he loves seeing the spark of wonder and delight in people's eyes when someone shares a novel, surprising, or beautiful idea. Daniel lives in Atlanta with a microbiologist and four aspiring rocketeers. Build systems have long been a standard tool within computer programming. Should make discover, upon its next invocation, that the main.c source code file now has a more recent modify time than main.o, then it will not only rebuild the main.o object file but will also rebuild prog itself. Build systems are a common semester project assigned to undergraduate computer science students — not only because build systems are used in nearly all software projects, but because their construction involves fundamental data structures and algorithms involving directed graphs (which this chapter will later discuss in more detail). With decades of use and practice behind build systems, one might expect them to have become completely general-purpose and ready for even the most extravagant demands. But, in fact, one kind of common interaction between build artifacts — the problem of dynamic cross-referencing — is handled so poorly by most build systems that in this chapter we are inspired to not only rehearse the classic solution and data structures used to solve the make problem, but to extend that solution dramatically, to a far more demanding domain. The problem, again, is cross-referencing. Where do cross-references tend to emerge? In text documents, documentation, and printed books! Systems to rebuild formatted documents from source always seem to do too much work, or too little. They do too much work when they respond to a minor edit by making you wait for unrelated chapters to be re-parsed and re-formatted. But they can also rebuild too little, leaving you with an inconsistent final product. This table of contents, as you can see, is a mash-up of information from four different files. While its basic order and structure come from index.rst, the actual titles of each chapter and section are pulled from the three chapter source files themselves. Because Sphinx chose to rebuild both documents, not only will tutorial.html now feature its new title up at the top, but the output index.html will display the updated chapter title in the table of contents. Sphinx has rebuilt everything so that the output is consistent. What if your edit to tutorial.rst is more minor? +Welcome to our project tutorial! In this case there is no need to rebuild index.html because this minor edit to the interior of a paragraph does not change any of the information in the table of contents. But it turns out that Sphinx is not quite as clever as it might have at first appeared! It will go ahead and perform the redundant work of rebuilding index.html even though the resulting contents will be exactly the same. You can run diff on the “before” and “after” versions of index.html to confirm that your small edit has had no effect on the front page — yet Sphinx made you wait while it was rebuilt anyway. You might not even notice the extra rebuild effort for small documents that are easy to compile. But the delay to your workflow can become significant when you are making frequent tweaks and edits to documents that are long, complex, or that involve the generation of multimedia like plots or animations. While Sphinx is at least making an effort not to rebuild every chapter when you make a single change — it has not, for example, rebuilt install.html or api.html in response to your tutorial.rst edit — it is doing more than is necessary. But it turns out that Sphinx does something even worse: it sometimes does too little, leaving you with inconsistent output that could be noticed by users. +Before reading this, try reading our :doc:`tutorial`! The title at the top of tutorial.html is now out of date, so the file needs to be rebuilt. The table of contents in index.html still has the old title, so that document needs to be rebuilt. The embedded cross reference in the first paragraph of api.html still has the old chapter title, and also needs to be rebuilt. Only two files were rebuilt, not three. Sphinx has failed to correctly rebuild your documentation. If you now push your HTML to the web, users will see the old title in the cross reference at the top of api.html but then a different title — the new one — once the link has carried them to tutorial.html itself. This can happen for many kinds of cross reference that Sphinx supports: chapter titles, section titles, paragraphs, classes, methods, and functions. The problem outlined above is not specific to Sphinx. Not only does it haunt other document systems, like LaTeX, but it can even plague projects that are simply trying to direct compilation steps with the venerable make utility, if their assets happen to cross-reference in interesting ways. If you remove all of the output, you are guaranteed a complete rebuild! Some projects even alias rm -r to a target named clean so that only a quick make clean is necessary to wipe the slate. By eliminating every copy of every intermediate or output asset, a hefty rm -r is able to force the build to start over again with nothing cached — with no memory of its earlier state that could possibly lead to a stale product. But could we develop a better approach? What if your build system were a persistent process that noticed every chapter title, every section title, and every cross-referenced phrase as it passed from the source code of one document into the text of another? Its decisions about whether to rebuild other documents after a change to a single source file could be precise, instead of mere guesses, and correct, instead of leaving the output in an inconsistent state. The result would be a system like the old static make tool, but which learned the dependencies between files as they were built — that added and removed dependencies dynamically as cross references were added, updated, and deleted. In the sections that follow we will construct such a tool, named Contingent, in Python. Contingent guarantees correctness in the presence of dynamic dependencies while performing the fewest possible rebuild steps. While it can be applied to any problem domain, we will run it against a small version of the problem outlined above. Any build system needs a way to link inputs and outputs. The three markup texts in our discussion above, for example, each produce a corresponding HTML output file. The most natural way to express these relationships is as a collection of boxes and arrows — or, in mathematical terminology, nodes and edges — to form a graph (Figure 4.1). Figure 4.1 - Three files generated by parsing three input texts. Each language in which a programmer might tackle writing a build system will offer various data structures with which such a graph of nodes and edges might be represented. How could we represent such a graph in Python? The Python language gives priority to four generic data structures by giving them direct support in the language syntax. You can create new instances of these big-four data structures by simply typing their literal representation into your source code, and their four type objects are available as built-in symbols that can be used without being imported. The list is a mutable sequence used to hold homogenous data — each item usually has the same structure and meaning as its peers. Lists can be used either to preserve data’s original input order, or can be rearranged or sorted to establish a new and more useful order. The dict is an associative data structure for storing values accessible by a key. Dicts let the programmer chose the key by which each value is indexed, instead of using automatic integer indexing as the tuple and list do. The lookup is backed by a hash table, which means that dict key lookup runs at the same speed whether the dict has a dozen or a million keys. A key to Python’s flexibility is that these four data structures are composable. The programmer can arbitrarily nest them inside each other to produce more complex data stores whose rules and syntax remain the simple ones of the underlying tuples, lists, sets, and dicts. This would allow quick iteration across all of our edges, fast insert and delete operations for a single edge, and a quick way to check whether a particular edge was present. Unfortunately, those are not the only operations we need. A build system like Contingent needs to understand the relationship between a given node and all the nodes connected to it. For example, when api.rst changes, Contingent needs to know which assets, if any, are affected by that change in order to minimize the work performed while also ensuring a complete build. To answer this question — “what nodes are downstream from api.rst?” — we need to examine the outgoing edges from api.rst. But building the dependency graph requires that Contingent be concerned with a node's inputs as well. What inputs were used, for example, when the build system assembled the output document tutorial.html? It is by watching the input to each node that Contingent can know that api.html depends on api.rst but that tutorial.html does not. As sources change and rebuilds occur, Contingent rebuilds the incoming edges of each changed node to remove potentially stale edges and re-learn which resources a task uses this time around. Our set-of-tuples does not make answering either of these questions easy. 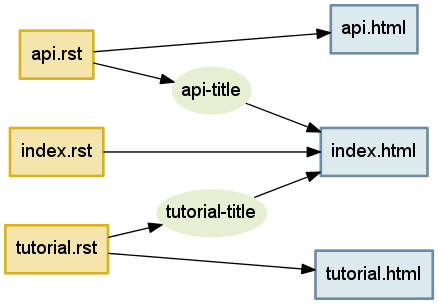 If we needed to know the relationship between api.html and the rest of the graph, we would need to traverse the entire set looking for edges that start or end at the api.html node. Looking up the edges of a particular node would now be blazingly fast, at the cost of having to store every edge twice: once in a set of incoming edges, and once in a set of outgoing edges. But the edges in each set would have to be examined manually to see which are incoming and which are outgoing. It is also slightly redundant to keep naming the node over and over again in its set of edges. The solution to both of these objections is to place incoming and outgoing edges in their own separate data structures, which will also absolve us of having to mention the node over and over again for every one of the edges in which it is involved. Notice that outgoing represents, directly in Python syntax, exactly what we drew in Figure 4.1 earlier: the source documents on the left will be transformed by the build system into the output documents on the right. For this simple example each source points to only one output — all the output sets have only one element — but we will see examples shortly where a single input node has multiple downstream consequences. Every edge in this dictionary-of-sets data structure does get represented twice, once as an outgoing edge from one node (tutorial.rst → tutorial.html) and again as an incoming edge to the other (tutorial.html ← tutorial.rst). These two representations capture precisely the same relationship, just from the opposite perspectives of the two nodes at either end of the edge. But in return for this redundancy, the data structure supports the fast lookup that Contingent needs. You may have been surprised by the absence of classes in the above discussion of Python data structures. After all, classes are a frequent mechanism for structuring applications and a hardly less-frequent subject of heated debate among their adherents and detractors. Classes were once thought important enough that entire educational curricula were designed around them, and the majority of popular programming languages include dedicated syntax for defining and using them. A class instance is implemented as a dict. A class instance is used like a mutable tuple. The class offers key lookup through a prettier syntax, where you get to say graph.incoming instead of graph["incoming"]. But, in practice, class instances are almost never used as generic key-value stores. Instead, they are used to organize related but heterogeneous data by attribute name, with implementation details encapsulated behind a consistent and memorable interface. So instead of putting a hostname and a port number together in a tuple and having to remember which came first and which came second, you create an Address class whose instances each have a host and a port attribute. You can then pass Address objects around where otherwise you would have had anonymous tuples. Code becomes easier to read and easier to write. But using a class instance does not really change any of the questions we faced above when doing data design; it just provides a prettier and less anonymous container. The true value of classes, then, is not that they change the science of data design. The value of classes is that they let you hide your data design from the rest of a program! Successful application design hinges upon our ability to exploit the powerful built-in data structures Python offers us while minimizing the volume of details we are required to keep in our heads at any one time. Classes provide the mechanism for resolving this apparent quandary: used effectively, a class provides a facade around some small subset of the system's overall design. When working within one subset — a Graph, for example — we can forget the implementation details of other subsets as long as we can remember their interfaces. In this way, programmers often find themselves navigating among several levels of abstraction in the course of writing a system, now working with the specific data model and implementation details for a particular subsystem, now connecting higher-level concepts through their interfaces. The Python language and community explicitly and intentionally emphasize using simple, generic data structures to solve problems, instead of creating custom classes for every minute detail of the problem we want to tackle. This is one facet of the notion of “Pythonic” solutions: Pythonic solutions try to minimize syntactic overhead and leverage Python's powerful built-in tools and extensive standard library. """A directed graph of the relationships among build tasks.""" The leading underscore in front of the attribute names _inputs_of and _consequences_of is a common convention in the Python community to signal that an attribute is private. This convention is one way the community suggests that programmers pass messages and warnings through space and time to each other. Recognizing the need to signal differences between public and internal object attributes, the community adopted the single leading underscore as a concise and fairly consistent indicator to other programmers, including our future selves, that the attribute is best treated as part of the invisible internal machinery of the class. Given these techniques, let’s examine the implementation of add_edge, which we earlier used to build the graph for Figure 4.1. """Add an edge: `consequence_task` uses the output of `input_task`.""" This method hides the fact that two, not one, storage steps are required for each new edge so that we know about it in both directions. And notice how add_edge() does not know or care whether either node has been seen before. Because the inputs and consequences data structures are each a defaultdict(set), the add_edge() method remains blissfully ignorant as to the novelty of a node — the defaultdict takes care of the difference by creating a new set object on the fly. As we saw above, add_edge() would be three times longer had we not used defaultdict. More importantly, it would be more difficult to understand and reason about the resulting code. This implementation demonstrates a Pythonic approach to problems: simple, direct, and concise. """Return all edges as ``(input_task, consequence_task)`` tuples.""" The Graph.sorted() method makes an attempt to sort the nodes in a natural sort order (such as alphabetical) that can provide a stable output order for the user. By using this traversal method we can see that, following our three “add” method calls earlier, g now represents the same graph that we saw in Figure 4.1. 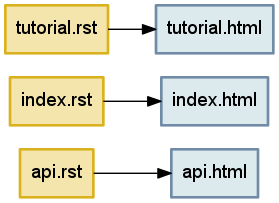 This Graph is telling Contingent that, when api.rst changes, api.html is now stale and must be rebuilt. """Return the tasks that use `task` as an input.""" The result is a graph (Figure 4.2) that could properly handle rebuilding the table of contents that we discussed in the opening of this chapter. Figure 4.2 - Being prepared to rebuild index.html whenever any title that it mentions gets changed. This manual walk-through illustrates what we will eventually have Contingent do for us: the graph g captures the inputs and consequences for the various artifacts in our project's documentation. We now have a way for Contingent to keep track of tasks and the relationships between them. If we look more closely at Figure 4.2, however, we see that it is actually a little hand-wavy and vague: how is api.html produced from api.rst? How do we know that index.html needs the title from the tutorial? And how is this dependency resolved? Our intuitive notion of these ideas served when we were constructing consequences graphs by hand, but unfortunately computers are not terribly intuitive, so we will need to be more precise about what we want. What are the steps required to produce output from sources? How are these steps defined and executed? And how can Contingent know the connections between them? In Contingent, build tasks are modeled as functions plus arguments. The functions define actions that a particular project understands how to perform. The arguments provide the specifics: which source document should be read, which blog title is needed. As they are running, these functions may in turn invoke other task functions, passing whatever arguments they need answers for. To see how this works, we will actually now implement the documentation builder described at the beginning of the chapter. In order to prevent ourselves from wallowing around in a bog of details, for this illustration we will work with simplified input and output document formats. Our input documents will consist of a title on the first line, with the remainder of the text forming the body. Cross references will simply be source file names enclosed in backticks, which on output are replaced with the title from the corresponding document in the output. ... Welcome to the tutorial! ... We hope you enjoy it. Now that we have some source material to work with, what functions would a Contingent-based blog builder need? In the simple examples above, the HTML output files proceed directly from the source, but in a realistic system, turning source into markup involves several steps: reading the raw text from disk, parsing the text to a convenient internal representation, processing any directives the author may have specified, resolving cross-references or other external dependencies (such as include files), and applying one or more view transformations to convert the internal representation to its output form. Contingent manages tasks by grouping them into a Project, a sort of build system busybody that injects itself into the middle of the build process, noting every time one task talks to another to construct a graph of the relationships between all the tasks. A build system for the example given at the beginning of the chapter might involve a few tasks. Our read() task will pretend to read the files from disk. Since we really defined the source text in variables, all it needs to do is convert from a filename to the corresponding text. The parse() task interprets the raw text of the file contents according to the specification of our document format. Our format is very simple: the title of the document appears on the first line, and the rest of the content is considered the document's body. Because the format is so simple, the parser is a little silly, but it illustrates the interpretive responsibilities that parsers are required to carry out. (Parsing in general is a very interesting subject and many books have been written either partially or completely about it.) In a system like Sphinx, the parser must understand the many markup tokens, directives, and commands defined by the system, transforming the input text into something the rest of the system can work with. Notice the connection point between parse() and read() — the first task in parsing is to pass the filename it has been given to read(), which finds and returns the contents of that file. This task nicely illustrates the separation of responsibilities between the parts of a document processing system. The title_of() function works directly from an in-memory representation of a document — in this case, a tuple — instead of taking it upon itself to re-parse the entire document again just to find the title. The parse() function alone produces the in-memory representation, in accordance with the contract of the system specification, and the rest of the blog builder processing functions like title_of() simply use its output as their authority. If you are coming from an orthodox object-oriented tradition, this function-oriented design may look a little weird. In an OO solution, parse() would return some sort of Document object that has title_of() as a method or property. In fact, Sphinx works exactly this way: its Parser subsystem produces a “Docutils document tree” object for the other parts of the system to use. Contingent is not opinionated with regard to these differing design paradigms and supports either approach equally well. For this chapter we are keeping things simple. The final task, render(), turns the in-memory representation of a document into an output form. It is, in effect, the inverse of parse(). Whereas parse() takes an input document conforming to a specification and converts it to an in-memory representation, render() takes an in-memory representation and produces an output document conforming to some specification. Figure 4.3 - A task graph. It turns out that Figure 4.3 was not hand-drawn for this chapter, but has been generated directly from Contingent! Building this graph is possible for the Project object because it maintains its own call stack, similar to the stack of live execution frames that Python maintains to remember which function to continue running when the current one returns. Push T onto the stack. Execute T, letting it call any other tasks it needs. Pop T off the stack. Packages the task — a function plus its arguments — into a small object for convenience. The wrapper here names the wrapped version of the task function. If this task has been invoked by a current task that is already underway, add an edge capturing the fact that this task is an input to the already-running task. Forget whatever we might have learned last time about the task, since it might make new decisions this time — if the source text of the API guide no longer mentions the Tutorial, for example, then its render() will no longer ask for the title_of() the Tutorial document. Push this task onto the top of the task stack in case it decides, in its turn, to invoke further tasks in the course of doing its work. Invoke the task inside of a try...finally block that ensures we correctly remove the finished task from the stack, even if it dies by raising an exception. Return the task’s return value, so that callers of this wrapper will not be able to tell that they have not simply invoked the plain task function itself. Steps 4 and 5 maintain the task stack itself, which is then used by step 2 to perform the consequences tracking that is our whole reason for building a task stack in the first place. The consequence of re-reading the tutorial.txt file and finding that its contents have changed is that we need to re-execute the parse() routine for that document. What happens if we render the entire set of documents? Will Contingent be able to learn the entire build process? the <a href="tutorial.txt">Beginners Tutorial</a> first. It worked! From the output, we can see that our transform substituted the document titles for the directives in our source documents, indicating that Contingent was able to discover the connections between the various tasks needed to build our documents. Figure 4.4 - The complete set of relationships between our input files and our HTML outputs. By watching one task invoke another through the task wrapper machinery, Project has automatically learned the graph of inputs and consequences. Since it has a complete consequences graph at its disposal, Contingent knows all the things to rebuild if the inputs to any tasks change. Once the initial build has run to completion, Contingent needs to monitor the input files for changes. When the user finishes a new edit and runs “Save”, both the read() method and its consequences need to be invoked. This will require us to walk the graph in the opposite order from the one in which it was created. It was built, you will recall, by calling render() for the API Reference and having that call parse() which finally invoked the read() task. Now we go in the other direction: we know that read() will now return new content, and we need to figure out what consequences lie downstream. In fact, recursive_consequences_of() tries to be a bit clever. If a particular task appears repeatedly as a downstream consequence of several other tasks, then it is careful to only mention it once in the output list, and to move it close to the end so that it appears only after the tasks that are its inputs. This intelligence is powered by the classic depth-first implementation of a topological sort, an algorithm which winds up being fairly easy to write in Python through a hidden recursive helper function. Check out the graphlib.py source code for the details. If, upon detecting a change, we are careful to re-run every task in the recursive consequences, then Contingent will be able to avoid rebuilding too little. Our second challenge, however, was to avoid rebuilding too much. Refer again to Figure 4.4. We want to avoid rebuilding all three documents every time that tutorial.txt is changed, since most edits will probably not affect its title but only its body. How can this be accomplished? The solution is to make graph recomputation dependent on caching. When stepping forward through the recursive consequences of a change, we will only invoke tasks whose inputs are different than last time. This optimization will involve a final data structure. We will give the Project a _todo set with which to remember every task for which at least one input value has changed, and which therefore requires re-execution. Because only tasks in _todo are out-of-date, the build process can skip running any tasks unless they appear there. Again, Python’s convenient and unified design makes these features very easy to code. Because task objects are hashable, _todo can simply be a set that remembers task items by identity — guaranteeing that a task never appears twice — and the _cache of return values from previous runs can be a dict with tasks as keys. Call recursive_consequences_of() and pass in every task listed in _todo. The return value will be a list of not only the _todo tasks themselves, but also every task downstream of them — every task, in other words, that could possibly need re-execution if the outputs come out different this time. For each task in the list, check whether it is listed in _todo. If not, then we can skip running it, because none of the tasks that we have re-invoked upstream of it has produced a new return value that would require the task’s recomputation. But for any task that is indeed listed in _todo by the time we reach it, we need to ask it to re-run and re-compute its return value. If the task wrapper function detects that this return value does not match the old cached value, then its downstream tasks will be automatically added to _todo before we reach them in the list of recursive consequences. By the time we reach the end of the list, every task that could possibly need to be re-run should in fact have been re-run. But just in case, we will check _todo and try again if it is not yet empty. Even for very rapidly changing dependency trees, this should quickly settle out. Only a cycle — where, for example, task A needs the output of task B which itself needs the output of task A — could keep the builder in an infinite loop, and only if their return values never stabilize. Fortunately, real-world build tasks are typically without cycles. Let us trace the behavior of this system through an example. The new tutorial text has now been read into the cache. How many downstream tasks will need to be re-executed? Looking back at Figure 4.4, you can see that, as expected, this is every task that is an immediate or downstream consequence of read('tutorial.txt'). But what if we edit it again, but this time leave the title the same? ... Welcome to the coder tutorial! ... It should be read top to bottom. This small, limited change should have no effect on the other documents. Success! Only one document got rebuilt. The fact that title_of(), given a new input document, nevertheless returned the same value, means that all further downstream tasks were insulated from the change and did not get re-invoked. There exist languages and programming methodologies under which Contingent would be a suffocating forest of tiny classes, with verbose names given to every concept in the problem domain. When programming Contingent in Python, however, we skipped the creation of a dozen possible classes like TaskArgument and CachedResult and ConsequenceList. We instead drew upon Python’s strong tradition of solving generic problems with generic data structures, resulting in code that repeatedly uses a small set of ideas from the core data structures tuple, list, set, and dict. But does this not cause a problem? Generic data structures are also, by their nature, anonymous. Our project._cache is a set. So is every collection of upstream and downstream nodes inside the Graph. Are we in danger of seeing generic set error messages and not knowing whether to look in the project or the graph implementation for the error? In fact, we are not in danger! Thanks to the careful discipline of encapsulation — of only allowing Graph code to touch the graph’s sets, and Project code to touch the project’s set — there will never be ambiguity if a set operation returns an error during a later phase of the project. The name of the innermost executing method at the moment of the error will necessarily direct us to exactly the class, and set, involved in the mistake. There is no need to create a subclass of set for every possible application of the data type, so long as we put that conventional underscore in front of data structure attributes and then are careful not to touch them from code outside of the class. Contingent demonstrates how crucial the Facade pattern, from the epochal Design Patterns book, is for a well-designed Python program. Not every data structure and fragment of data in a Python program gets to be its own class. Instead, classes are used sparingly, at conceptual pivots in the code where a big idea — like the idea of a dependency graph — can be wrapped up into a Facade that hides the details of the simple generic data structures that lie beneath it. Code outside of the Facade names the big concepts that it needs and the operations that it wants to perform. Inside of the Facade, the programmer manipulates the small and convenient moving parts of the Python programming language to make the operations happen.